Were the odds ever in our favor? "Tick, tock. Are you the Mockingjay? Come as a tribute, ready to train and survive in an outdoor, overnight game. Party at the capital. Gain new outdoor skills relating to the Hunger Games. Test your skills as you participate in the Quarter Quell. Go to the cornucopia, form alliances, and see who survives the night. Tributes will choose training sessions. Leaders will spend both nights indoors. Tributes will spend one night outdoors with staff." And they were all in. I was also thinking this could be fun, especially the part about leaders spending both nights indoors. As the day came closer, we made our plans, even though the "game makers" (girl scout planners) were keeping the exact plans pretty close to their proverbial patch-adorned vests. We knew the date and the place and the general idea. We knew it was rain or shine and where to get inexpensive rain gear. We knew the general gist of things as described above. But we didn't know if it would be lame or whether the girls would like it. We were pretty sure that it wouldn't actually be a battle to the death like in the books, but what other things would be included? Weird fashion and beauty choices (dyed skin plays a part in the books)? Mid-game rule changes? Poisonous berries? Our first snag was a scheduling snafu for Colleen and her daughter, who it turned out had another can't miss commitment the same weekend, so they were out. We ended up with two extra girls and just one leader, me. We arrived and found our cabin and cabin-mates, a mom with two troops, one the older daughter's one the younger's, who had been here last year. I could feel my shoulders relax as I considered the endorsement of a return trip. We went down to the main building for the promised "Party at the Capital" (Next-level icebreaker activities, and yes, some kids did the floss.) Some of my girls latched on to some older girls who were similarly just a bit above all of this scout-y forced bonhomie. It was just lame enough to make a friend by rolling your eyes in solidarity but not so lame you sat in the corner on your phone. The thing about the phones was, there was basically no cell service at all (except this one woodshed where there would sometimes be someone pacing in front of, trying to get a text out). Which was fortunate, because this was not a group that would take kindly to being told cell phones were not allowed. This was sinking in as my girls realized they hadn't packed chargers anyway as we prepared to "sleep." I don't know if you've been in one big room with 18 girls and four adults, but there's not much sleeping. There were a few stern warnings to "Shut Up" lobbed across troop lines. And guess what? Those last whispers back and forth keeping me up were between two troop leaders who had shown up late. But morning eventually came. 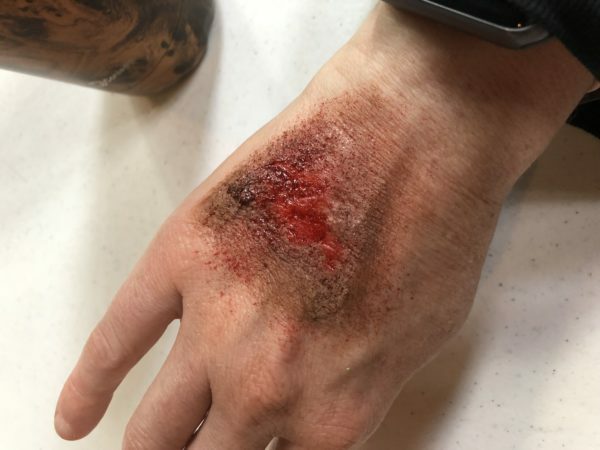 The next day, we set off to breakfast with bug spray applied and the girls were able to sign up for classes in archery, special effects makeup (see my "injury" below), survival skills, jewelry making and fashion design (screen printing on t-shirts) and even soldering. The girls chose their favorites and I think enjoyed what they got to do. We reconvened for lunch and found that lunch had not arrived, and we wouldn't be eating for two hours. They had some fruit and chips for snacks and told us we could do whatever we wanted -- the survival teacher was available for demonstrations, there were hiking paths we could take, we could go back to our cabins, or we could take rowboats out on the lake. Our girls went down to the lakefront, where three of the lifeguard-certified counsellors were stationed. Some took a boat out while others conspired to go for a swim. I warned them that they would have to swim in their clothes and that those clothes would definitely be wet for the rest of the trip. They all had extras of everything and one by one they all came to the conclusion that swimming was the thing to do in this 80-plus degree weather, no matter what. 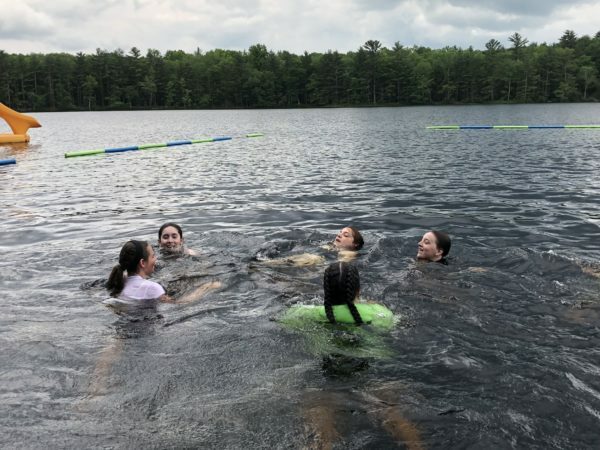 They jumped in and bobbed around together, along with several other girls on the trip. When I asked them at the end of the day what was their favorite part, they all easily put that swim at the top of their lists. One girl suggested it was the unexpected part, and the feeling of breaking the rules that they liked the best. At the end of the day, the girls were given instructions about how to prepare a Meal Ready to Eat, or MRE. The ones they had were the same as people in the military had to eat while out on a mission. They were pouches of stew-like substance, prepared with a self-heating pad that got so hot it could burn them. They were not thrilled. But just as soon as the demonstration was over, it was time to head to the cornucopia. The cornucopia turned out to be a tarp covering a bunch of items they were told they'd need that evening. They lined up and were released as the tarp was pulled back to reveal . . . . the MREs. Also forks and other items needed to eat their meal. Each item had a small square of patterned duct tape. They had to find the other girls with the matching pattern on their items, and then this group was in an alliance and also sharing a tent or cabin. They went off to grab their overnight things and find out where they would be sleeping. After about 45 minutes, two of my girls came back to the main building to find me. Their faces said "This is bullis! *T" And they were completely sure that eating these gross meals and sleeping in a TENT, not a CABIN as they had understood, was just a no-go. They also realized that they were the only two in their tent, while other tents or cabins had 5 to 9 girls. The cabins and tents were part of the game they would play for a few hours that night. Each one had a flag that could be captured, rendering its inhabitants "memories " in the game. They were at a strategic disadvantage, and they were hangry. I gave them a little pep talk and some snacks and we talked about how they could maybe see if they could work with another group or get into a cabin. The head of the encampment saw that we were having a struggle and helped the girls get back into the game. She said to me that advocating for what they needed showed that they were strong. And she said, "You want your daughters to have that skill when they start working. You want them to have that skill when they start dating." That resonated with me. This trip was dressed up like a movie-themed fun weekend, but it was really such a growth opportunity for the girls. They got to choose which classes they took, they got to decide whether to go swimming in their clothes and if they would mind not having a towel at the end. They were basically on their own (with camp counselors in the background making sure nothing went terribly awry) all night. In the end, some of them did just fine, and were truly strengthening skills they already had to make friends and be independant and a little physically uncomfortable. Some, like mine, kept their phones and somehow got a text to me (we each must have passed that woodshed at some point) when the bugs were too big. I flagged a counselor down and asked her to check on my daughter and see if she was okay, and tell her she didn't have to stay. She returned to my cabin a few minutes later, her twin sister in tow. As the night wore on, girls trickled back in, escorted by a counselor or two who were murmuring comforting things and then heading back out. I heard stories of vomiting in the night, crying and panic attacks and at least one case of heading home before dawn. Our discussion in the car on the way home was pretty light. No one had any revelations about how they'd all pushed themselves at least a bit outside of their comfort zone. I dropped each girl at home and was truly thrilled to pull in my own driveway. We found the ticks pretty soon, showered our way back to normal and my daughters headed to their corners of the house, as 13-year-olds will do. At least I still have Bitey and Violet, Jr.